At Hormel Foods, we’re proud of all of our work supporting cancer research and promoting cancer nutrition. Through The Hormel Foundation and The Hormel Institute, we are working every day to help move forward cancer research, education and awareness. 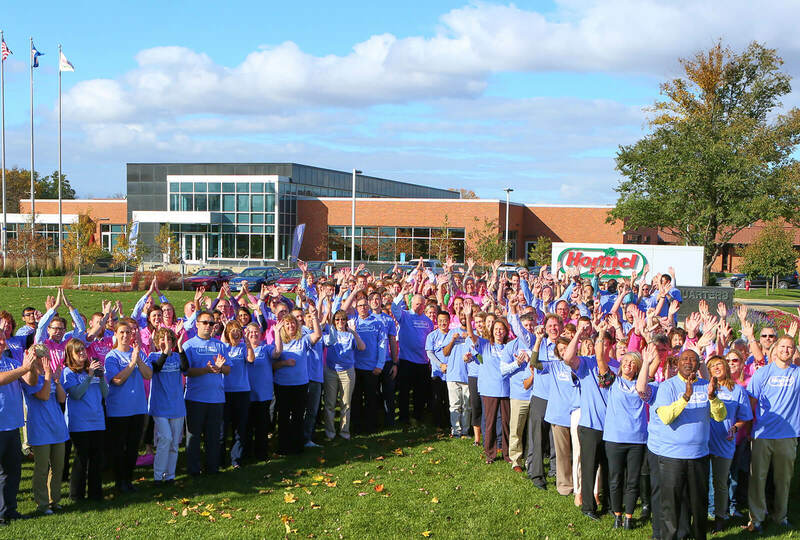 This year during Breast Cancer Awareness month, more than 275 Hormel Foods and The Hormel Institute employees gathered to raise awareness and show their unified support for cancer survivors, patients battling cancer, and all of those working to find cause and cure. We’ve joined together to create our own Hormel Foods cancer awareness “living ribbon.” Our pink ribbon outlined by lavender signifies the fight for all cancers with a special dedication to our Hormel Foods team members and families who are living with breast cancer. We are issuing a challenge to other companies and organizations to join us on our journey to raise cancer awareness. We’re challenging you to bring your teams together and create your own cancer awareness ribbon. Share your support and creation using #InspireCancerAwareness and let’s show the world we’re all in this together.